Always in motion is the future, at least for Mayor Parker. Mayor Annise Parker left open the idea on Sunday that she would endorse one of the dozen candidates positioning to possibly succeed her, though she said she hoped to avoid doing that early in the race. Parker, term-limited after winning election three times, has in the past expressed annoyance with the long-whispered highly-anticipated race. On Sunday, Parker said the campaign is already affecting interactions on City Council, where three councilmen — Oliver Pennington, Stephen Costello, and Jack Christie — could replace her. Houston’s departing mayor also said she was likely to run for higher office, hinting at a potential statewide bid in 2016 or 2018. Parker said that while she would not miss campaigning after leaving City Hall next year, she would miss governing. 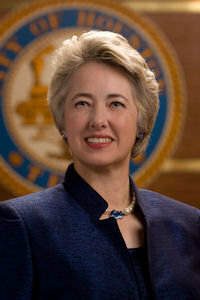 Mayor Parker has discussed the possibility of running statewide before, so this is no surprise. The only office available in 2016 is David Porter’s seat on the Railroad Commission, so it’s been my expectation that she really just means 2018. I haven’t watched the video, so I don’t know if this was her saying something different, some lack of clarity in the question or answer, or a transcription problem. Be that as it may, the main point is she’s still potentially interested in a statewide run down the line. As for endorsing a successor, I think if she had a preferred successor in mind, we’d know it by now. There are likely several people in this race that she would at least be OK with if they won, and there’s not much to be gained by needlessly alienating a friend. My guess is that she’ll be like many other office holders and endorsing organizations and keep her powder dry till a runoff, when the choice may be sufficiently stark. But who knows? Campos has more.